Just in time for summer sports season, Wexford University offers an online Master’s Degree in Applied Sport Psychology, focusing on the growing field of sports psychology. The online summer session begins June 24. Earning a degree in applied sport psychology is ideal for coaches, trainers, instructors, mentors and psychologists in the sports and fitness industries. Baseball, soccer, swimming and tennis are some of summer’s hottest sports. To that end and to better serve athletes in all sports and at all levels, Wexford University offers an online Master’s of Science Degree in Applied Sport Psychology, with summer classes beginning June 24. 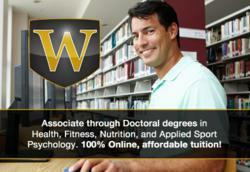 Students can register now for summer classes and learn more online at http://wexford.edu/degree-programs/applied-sport-psychology-online-masters-degree/. No matter what the sport or the season, sports psychology pros and coaches can help athletes of all levels with the mental portion of sports competition and fitness training. The online program at Wexford University focuses on mental training skills, including focus, relaxation, goal-setting, leadership and reducing anxiety to help athletes increase performance and confidence. Wexford University’s online Master’s Degree in Applied Sports Psychology focuses on the critical role the mind plays in the world of competitive sports; the ideal combination of classroom and practical experience working with athletes; critical thinking skills that can be used to benefit athletes; and preparing for a potential doctoral degree in Applied Sport Psychology. Upon graduation with a Master’s Degree in Applied Sport Psychology, graduates may choose to apply for certification with the Association of Applied Sport Psychology (AASP). Wexford University’s summer session offers convenient and flexible scheduling of online classes as well as a variety of health, fitness, nutrition and wellness degree programs of all levels.